Lombok and The Gili Islands are how most people envision paradise. The luscious greenery fringed with pearlescent white beaches, a peaceful atmosphere and friendly locals are why many tourists come here to experience the quintessential remote island experience. Each one of the islands has its own personality. If you’re looking for a chic, cosmopolitan vibe to go with your cocktail, Trawangen is the one for you. With a variety of bars and restaurants to choose from, this island utopia is becoming a hotspot for tourists and holidaymakers, but still remains remote enough to enjoy that castaway experience. If you’re looking for a quiet retreat that’s full of local character, then Gili Air is perfect for you. With a population of just under 2,000, this tropical island is popular with honeymooners and solo travellers. Gili Meno is the smallest of the islands and is perfect for those looking to sink their toes into untouched white sands during an idyllic island getaway. The natural beauty of The Gili Islands provides the perfect backdrop to your holiday, and each one offers breathtaking scenery with very little concrete interruption. There is no motorised travel on the islands, so peace and quiet is assured. There are no airports on The Gili Islands, so flights to Bali from the UK provide the best route. Once you have landed take a ferry to Lombok and catch a local boat to The Gili Islands. Our Lombok & The Gili Islands hotels suit all holidays. If it’s a cheap Trawangen hotel that you’re after then the Hotel Vila Ombak is perfect. The traditional Lombok style huts are right on the shores of the idyllic white beach, creating the perfect blend of first-class accommodation and the laid back Gili lifestyle. 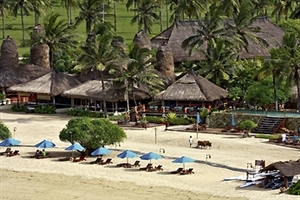 One of the best hotels in Lombok is the Novotel Lombok. Set on the stunning Kuta Beach, here you’ll be able to enjoy a range of facilities including a swimming pool, a fitness centre and four on-site bars and restaurants. Your Lombok & The Gili Islands holiday will be one to remember, and choosing the right hotel will ensure you enjoy a comfortable stay. But what else is there to do on these idyllic islands? The Turtle Sanctuary, Gili Meno - Baby turtles are kept and nurtured here for eight months before being released into the wild. This amazing place is perfect for seeing some baby turtles, just bring a snorkel and you’re pretty much guaranteed a sighting. Gili Cooking School, Trawangan - Learn to make some traditional Gili dishes here to impress your friends and family when you get home. Fishing Tours - Fishing tours are frequent on the islands. Just hop on a boat and be driven out to catch your own fish, which you can later grill and eat. Full Moon Celebration, Trawangan - This full moon is nowhere near the scale of the famous one in Thailand, but with top DJs and the beautiful beach, you’re bound to have the time of your life. Lombok and The Gili Island holidays are perfect for relaxing by the beach and living out that idyllic island lifestyle, and with the right hotel you’ll have an exotic and dreamy adventure that you’ll never forget. Here is just a selection of our favourite and cheapest hotels in Lombok the Gili Islands. Please use our search panel above to find your perfect choice. On the magical island of Gili Trawangan just off Lombok's north-western coastline, built in traditional Lombok style huts the Hotel Vila Ombak offers first class accommodation and modern amenities under rustic thatched roofs. The exotic rooms feature an upper floor bedroom with adjacent big balcony, a spacious open-air living-area underneath ... and a semi-open bathroom. Set on the spectacular white sands of Kuta Beach on Lombok island’s beautiful southern coastline, the Novotel Lombok brings international-brand quality and comfort to a stunning tropical location. Offering the choice of102 guestrooms and suites, the Novotel Lombok is an ideal base for those seeking a romantic holiday for two ... or for those travelling with family, while facilities include a swimming pool, a fitness centre and four on-site restaurants and bars. 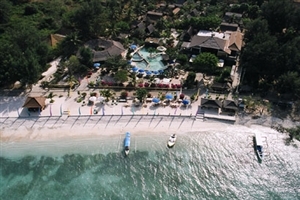 The Novotel Lombok is located 19km from Bandara International Lombok Airport.